Richard Burton is writing on the Svbtle network. Over the last 10 years, I have been lucky enough to see kiteboarding make the transition from being the pastime of a few diehards into a mature and accessible sport that’s relatively easy to learn. In the early days, there were small pockets of kiteboarders spread across the world. These pioneers didn’t work in isolation; they were able to share their ideas on sites like KiteForum.com. They posted clips of new tricks that they’d landed, improvements they’d made to their gear, safety tips, amazing new locations, and anything else they thought other kiteboarders should know. Although the early kiteboarders were heavily influenced by wakeboarders and surfers, they did invent a trick that’s unique to kiting and its evolution has played out over YouTube. A kiteloop is a trick that involves spinning the kite whilst in the air to generate an enormous surge of power. This results in the rider being pulled through the air horizontally and feels similar to a high-speed roller coaster setting off. In the video below, a rider called Moehau Goold had rigged his kite with incredibly short lines and was trying to loop above it. The clip was shot in 2003 at Kite Beach, Maui. Although he didn’t quite land it, everyone on the forums went nuts. Three years later, a young dutch rider called Ruben Lenten started to make his mark on the sport. He would go out in the strongest winds he could handle, jump over 50 feet, and loop the kite as low as possible. This soon became his signature move and he called it the megaloop. Here’s an early clip of him from 2006 going for a particularly big one in the Netherlands. Over the years, lots of riders started to mix kiteloops and megaloops with other tricks to come up with incredible combinations. One such combination is a kiteloop handlepass which requires a rider to unhook the control bar from their harness and pass it behind their back whilst the kite loops behind them. These incredible acrobatic feats filled the heats of the kiteboarding competitions around the world. In the off-season, top riders would often share footage of what new tricks they’d been working on. The clip below features the 5x World Champion Aaron Hadlow and was released in 2010. He takes the time to explain how he mixes megaloops with other tricks and makes it look effortless. These videos and others gave me and my friends the inspiration to go and start looping the kite in stronger winds. Soon enough, people at my local beach were throwing respectable kiteloop backrolls and even the odd megaloop. What was surprising to me was just how fast these kinds of tricks became the norm at beaches around the world. 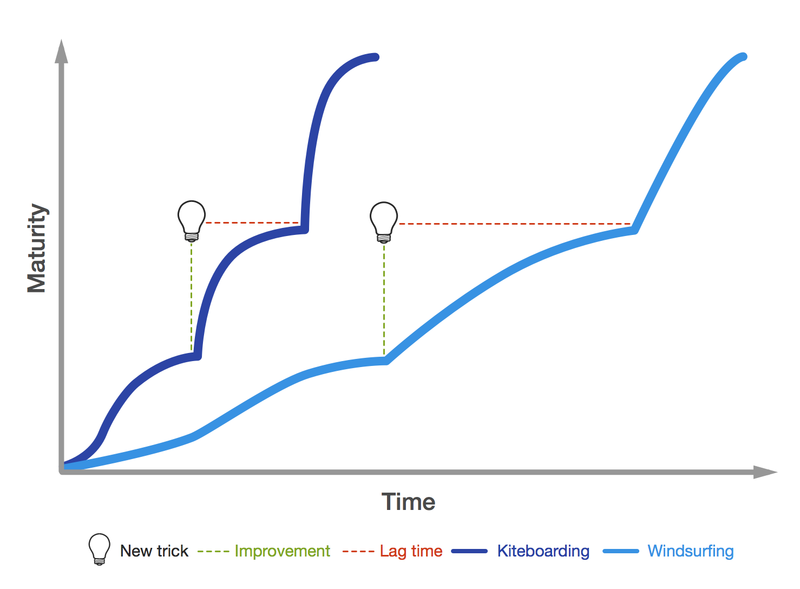 The lag time between someone inventing a new trick and everyone else catching up is much smaller when the innovators can distribute their ideas instantly. This effect has compounded the rate at which kiteboarding has matured and helped it to develop much faster than a sport like windsurfing. As windsurfing became popular in the 80s, the best riders were learning from each other at a few select beaches in Hawaii, at competitions, or through high budget VHS tapes that were distributed by mail. The lag time was much greater which hampered the sport’s progression. Once you’re aware that something can be done, it becomes easier to comprehend how you can do it too. The true pioneers are able to invent something completely new by building on the inventions of others. The internet speeds up this process. Of course, this phenomenon isn’t unique to kiteboarding — the internet is changing everything — nevertheless, it’s been fascinating to see how it’s affected the sport I love. As a coda, I highly recommend checking out this final video for a glimpse at the future of kiteboarding. My thanks to Alex MacCaw, Sam Morrison, Tim O'Shea & Hassan Wardani for reading drafts of this.